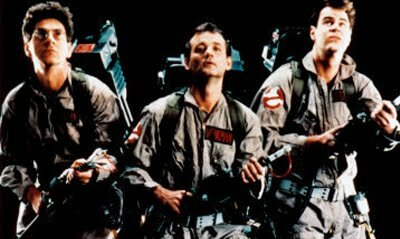 If you think Superman looks pretty good for a dude over seventy, you need to dig out Ghostbusters and Ghostbusters II at your nearest DVD retailer and spend a few hours reliving some family-friendly fun that spookily has rarely aged itself in over 20 years. The special FX still pass, Bill Murray's one-liners still crack a few laughs and due to the acting talents of the likes of Rick Moranis and sci-fi queen Sigourney Weaver the plot still solidly hooks you. (A certain blogger who shall remain nameless even jumped recently, checking out part two - but only once honest - I ain't afraid o' no ghost). And whatever happened to that 80's movie staple where when all the evil went down all the clouds in the sky whirled into a vortex? That stuff was awesome. Here vortexes, Slimer's and haunted kitchen appliances are still in play, meaning the flashbacks you get are well worth the price of purchase... remember seeing this on the big screen? Bought the Blu-ray version of the first movie the day it came out. The transfer isn't quite perfect, but it's still the best one ever to be released on home video. And let me assure you, it makes the Stay Puft Man look gooier than ever! Thanks for that Marc! I haven't made the leap to Blu Ray yet so for the moment I'll have to take your word for it!